Gebre Gebremariam won the New York City Marathon in his debut at the distance, an unexpected Ethiopian champion on a day when his favored countryman, world-record holder Haile Gebrselassie, dropped out because of injury. Kenya's Edna Kiplagat was another surprise winner, while Shalane Flanagan, making a marathon debut of her own, became the first American woman in two decades to finish second. The world was still closely watching the race after the elite runners finished: rescued Chilean miner Edison Pena was trying to complete the 26.2 miles after jogging the tunnels while trapped underground. The 26-year-old Gebremariam became the first man to win New York in his marathon debut since Rod Dixon in 1983. The 2009 cross-country world champion pulled away from Kenya's Emmanuel Mutai in the 24th mile to win in 2 hours, 8 minutes, 14 seconds. "New York is New York -- it's so special for me just to finish,'' Gebremariam said. Another Kenyan, Moses Kigen Kipkosgei, was third. Defending champion Meb Keflezighi of the United States finished sixth. Gebrselassie pulled out at the 16-mile mark with an apparent right knee injury. The 31-year-old Kiplagat won her first major marathon title in 2:28:20. Flanagan, the 2008 Olympic bronze medalist in the 10,000 meters, was 20 seconds back. Kim Jones in 1990 was the last American woman to finish in the top two. Kenya's Mary Keitany, also making her marathon debut, was third. More than 45,000 runners started the 41st edition of the race through the city's five boroughs. Meantime, thousands of runners are making their way through the grueling 26.2 mile New York City Marathon, winding through all five boroughs to complete the unforgettable race. At just under three hours, some were finishing the race. The field of more than 43,000 runners includes Edison Pena, the Chilean miner rescued last month who jogged through the tunnels while trapped underground. 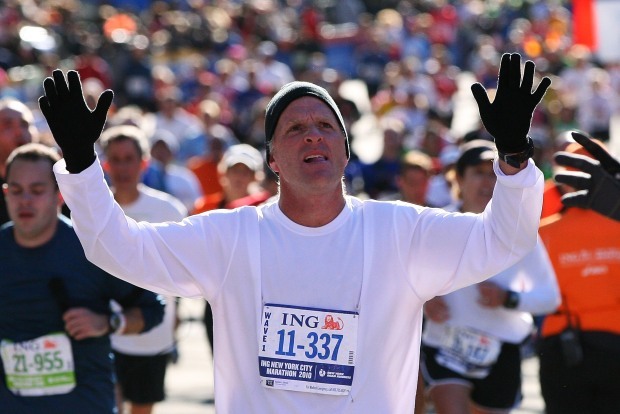 He fought knee pain to finish the race in 5 hours and 40 minutes. New York Road Runners President Mary Wittenberg said that as of Saturday, the odds were low that Gebrselassie would even start the race. She said he had his knee drained and was given cortisone. "At that point you realize you might not have the dream finish," she said.